When you are heading out to deep waters looking for the catch of the day, nothing can ruin your trip more than being skunked. Knowing how to catch more fish is a skill that’s been sought after for generations, and today’s fisherman still has very little control on the outcome of a fishing trip. Whether you are using your own personal vessel, boat or yacht, every sport fisherman wants to know the same thing and that’s how to catch more fish. When it comes to this topic of course, there’s a lot of opinions but very little facts. Taking your yacht on a deep sea fishing expedition can prove much more fruitful when you use some proven tactics to improve your catch yield. Using a few of these following tips can provide you with the helpful insight to make your next trip out the most fruitful one. The drift can be used to catch more fish by using a few methods that have been tested against time. One of the more popular methods is by using your rudder angle. Because your bait is trailing your outboard, the use of your rudder to turn or “spray” your drift can help spread your bait and increase your chances of catching a fish. This will of course vary depending on what type of vessel you are fishing from, or what you are specifically fishing for. Dragging a drift-sock behind amidships can help expand your spread and increases the efficiency of your bait. Keeping your enticing bait near the bottom of the ocean not only increases your advantage but also keeps fish like halibut or tuna near your line. Browse online reviews of products designed for bolt on drift modifying ability and see which drift sock is right for you. Reading other from the experience of other sport fishermen can help you make an informed choice. Outboards can flex and cause damage to the joints of your boat transom, and lead to decreased performance as well as increased noise and vibration. This problem can be exaggerated when you are towing your boat to and from the water from long distances, as well as problems to rear cross member mounting. Correct this issue and protect your long term investment with a transom saver. Installation on your boat can be a simple process with the right tools, and some captains mount the saver to the trailer’s rear roller. Tighten your saver and keep your outboard’s lower assembly astern, where it belongs. Using this simple device, you can catch more fish with less deflection and movement from the outboard due to the increased support. Installing this brace can eliminate the flex and damage that may occur. If you don’t want to use a transom bracket, you should never use the flip lock to secure the outboard in any scenario. Fishing from a leisure vessel is easy and fun to do, contrary to popular belief. Just because you are on a yacht or even power boat doesn’t mean you can’t sport fish. There are a few tactics you should learn before trying to fish from a non-fishing vessel. Trolling is the act of trailing your lure behind your vessel at low speeds. The angle of your troll or the relation of the depth to your fishing line has a lot to do with your success rate of catching fish. Depth plays a bigger role here than you might think, so make sure to your yacht is moving ahead under almost no power. 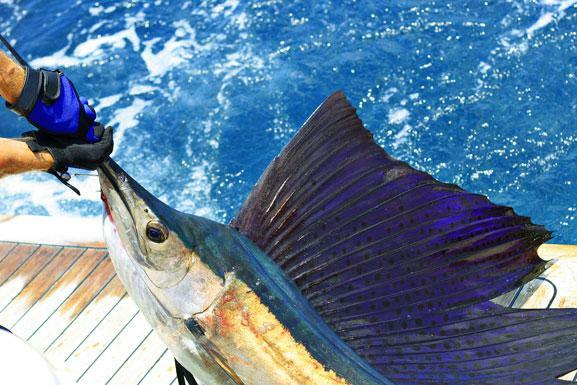 Securing your line to the yacht tackle or mast is an easy way to get started when you want to sportfish on a budget. If you are too deep the excessive angle will result in you losing more bait than catching fish, so be mindful of your depth. Experiment with different angles by using shallow depth lines or slightly increased speeds. Always remember that you should never troll near other boats and especially near entryways of ports, harbors or bays. This poses a serious danger to the yacht and everyone aboard as well as others. Once you’ve found the right angle of troll, you will see a lot of mackerel or garfish activity and sometimes even bass. Jigging your line is a suitable method to increase your yield rate when sportfishing, and can be effective if not a bit slow. Because you are not moving at much speed you won’t be covering much ground, so this may be something of a last ditch effort if you are nearing the end of the fishing day. From a drift lower a longer line from your yacht using a heavier weight, and use several sections of bait to feather your range. Lower your line and “jig” the lure up and down repeatedly until you either catch something or hit something. If you do catch more fish through this method, pull back the line and mark it so you know how much line to use. Repeat your jigging until you catch another or try your luck at another location. Snapper is an easy target near the coastline, but make sure to keep your yacht or boat clear and watch your line closely. You don’t want to wind line round your hand by allowing your line to become caught in rocks. 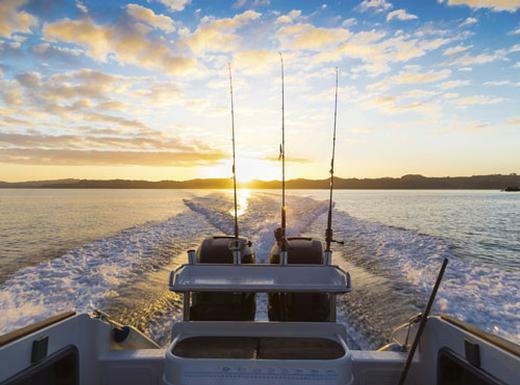 Use any of these handy tips to catch more fish and increase your yield when you are sport fishing or fishing from a yacht. These tactics have been proven over time and can help catch more fish, but if you want to learn more check out our sportfishing section.